Other Products: Candied Apple, Fired Brick and Peeled Paint Distress Oxide inks, WOW metallic gold sparkle embossing powder, Versamark Ink, red and green cardstock. Instructions: Take a 6" x 6" white card base and die cut it in the center with the smaller outline ornament die from the Noel Ornament Die. Cut a piece of 5 3/4" x 5 3/4" piece of pattern paper from O Holy Night Paper Collection and die cut it in the center with the larger outline ornament die from the same die set so that it aligns with the die cut on the card base and adhere it to the card front as shown. Die cut the back piece of the card base using the detailed die from the same set, carefully aligning it with the die cut on the front panel. Die cut a piece of Vellum Paper with the outline ornament die and adhere it to the back of the detailed die cut on the back panel. Stamp the sentiment from Silent Night Scroll Cling Stamp Set on a piece of white cardstock using Versamark Ink and heat emboss it using WOW metallic gold sparkle embossing powder and Heat It Craft Tool. 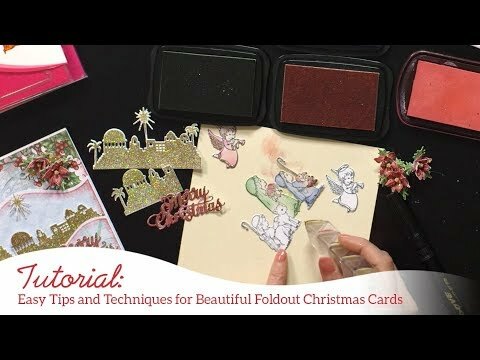 Die cut it using matching die from Silent Night Scroll Die. Color it with Candied Apple, Fired Brick and Peeled Paint Distress Oxide inks using Fantastix Blending Tool. Die cut 4 more pieces of white cardstock using the same die and stack and glue them. Keep the embossed piece on top. Cover the top with 3-D Crystal Lacquer and let it dry competely. Die cut a 5" x 2 1/2" piece of white cardstock using the border die from Delicate Border Basics Die. Die cut a piece of pattern paper from O Holy Night Paper Collection using the border die from Classic Border Basics Die. Align and adhere them together. Die cut this piece using the largest ornament die from Noel Ornament Die. Use a thin line of Designer Dries Clear Adhesive on the curved side edges and adhere it to the card front as shown. Use Stack and Store Daubers and Coffee Archival Ink to ink the center part of the pattern paper and glue the sentiment die cut on top. Die cut 2 pieces of white cardstock using the corner die from Cut Mat Create 2B Die. Glue them to the top left and bottom right corner of the card front. 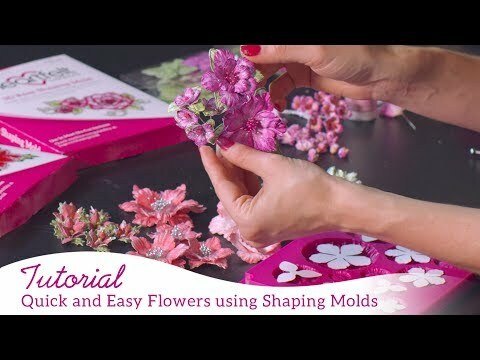 Arrange and adhere the flowers and leaves on the die cuts as shown. Add a few gold stamens from Assorted Pearl Stamens to the poinsettias cluster to add finishing touch.